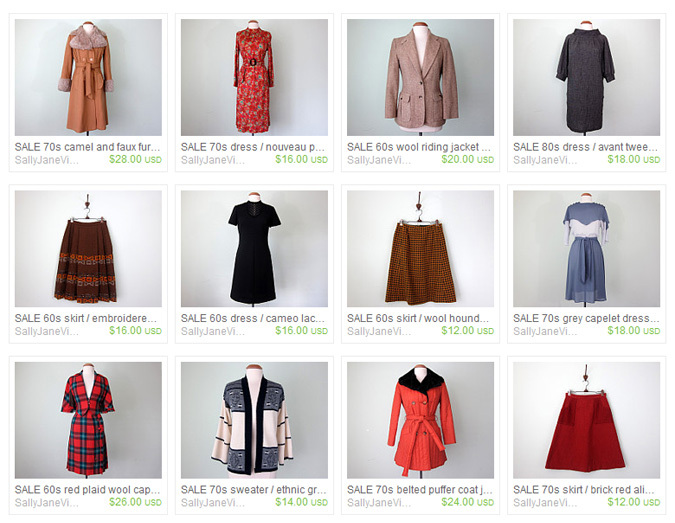 Sally Jane Vintage: End of Season ETSY SALE! End of Season ETSY SALE! I just marked down nearly the whole shop (almost 130 items) to make room for all of the spring pieces that I'm so excited to show you. Please help me clean out the shop to make some room! Almost everything has been reduced to under $20. Remember I give discounts for combined shipping so feel free to take advantage. You can find everything in the SALE SALE SALE section. Shop away! Great clothes! Loving all the patterns and colors! Very nice blog! ooo, this is dangerous, i am trying to save for an upcoming trip to paris!! !